Instead, the circus has been in town for the past two years in the Twin Cities. Starting with Childress’ courtship of Brett Favre after the Jets offered a cordial “no thanks” to Favre and his ego, to this offseason’s continuance to stroke Favre’s ego, the Randy Moss situation and mismanagement of the team eventually lead to his demise. As many other sports journalists are writing, with Childress’ head delivered, so too should Brett Favre’s be, right there on a silver platter. Some argue that his legend is dead. Is he playing for stats? Records? Money? Veteran leadership opportunities? Brett is a hall of fame quarterback in the green and yellow. The past three years have been a farce. Favre benefited last year from the opponent’s fear of their rushing game, not to mention one of the best defenses in the league. Both have been ordinary this season, and that’s being generous. So Favre was left to be quarterback. It’s what everyone wanted, right? the problem is that he has nothing left to prove. Nothing but unsubstantiated hoopla. A consecutive starts streak, yard, touchdowns sacks… you name it… all in the name of Brett Favre. My favorite was how he wanted to bring a Superbowl to Minnesota. Riiiight. It takes a team to get there, and right now, Brett Favre is the team. And all that is is a name, a name of old that can only play like he is old. 2011 starts today for Minnesota, it should be Tavaris Jackson time- at least for the rest of the season. Whether he is or isn’t the guy is topic enough for another entry, and one that I won’t do being as that I don’t care about the Vikings or Favre. Lastly, I think one very important fact is getting lost amid all of this chaos and instability at the head coaching position around the league. 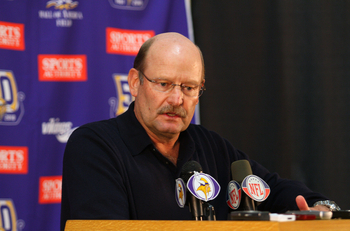 The packers have now delivered the knockout punch to TWO coaches! The Cowboys promptly fired Wade Phillips after the Pack stomped all over Dallas, and now Childress. And believe it or not, they have the chance to deliver 2 more by the end of the season! Week 13 brings the 49ers to Lambeau where Mike Singletary has been on the hot seat after a horrendous start. The last week of the season has Lovie Smith and the Bears coming to town. It seems that it is Playoffs of bust for Chicago this year. We’ll have to stay tuned to see if the Packers can take out any more head coaches! Today, the former king of swing (dethroned only by another fellow ‘roider) finally came clean after the quite physical evidence of his choices were captured by cameras and seen by the nation for the past decade. Come on, who of you out there were wholeheartedly surprised by this announcement? In fact, as a baseball fan, I am a bit offended by the timing of his announcement. Not even a week ago, McGwire might have even been voted into the Hall of Fame! Looks like it was one and done. What could have motivated him? Why now? I think he knew he could never shake the stigma of The Juice. He conveniently waited to see if he would make it this one time. He was a long shot, and one, he will forever remain. But then, is it plausible to say that the theatrics of the Steroids Era was engineered and puppeteered by Big Baseball itself? You’ve heard it all before all over the airwaves. Baseball, America’s Game was sagging behind the NFL in attendance and popularity. A strike towards the beginning of the decade only made the situation worse. In a decade of almost unfettered economic growth, of getting ahead at all costs, the 90s and the Steroid Era go together quite well. But in the end, it all falls down on itself. McGwire and Enron, A-Rod and Bernie Madoff, even Palmeiro and US Banks all had their heyday only to be exposed for what they were. Living the American dream. Using performance enhancing drugs is cheating. Mark McGwire is a cheater. But don’t you worry, he and (I can’t believe I’m saying this) Sammy Sosa had quite the supporting cast- many of which are still TBD. The steroids era (we can only hope) is in its final act. They will have their curtain call soon. What is the team left with? Many see shambles and a humbling very sub .500 season in the immediate future. While others feel that this was a necessary, inevitable decision, and perhaps evidence of gut-wrenching dedication to establishing a new foundation to the team. I’m with the latter group. I love these veteran players. While injuries surely resulted in the gradual phasing out of Galloway from the offense this past season, he presented a deep threat that had never been a daunting part of the Buccaneer offense in recent memory. (See: Jacquez Green and Reidel Anthony = fail.) We can only hope that we continue to continued production from Antonio Bryant to fill this void. Losing Hilliard is monumental as well. I don’t know if we have a replacement in the fold as of yet. He was, for the years he was here, our best 3rd down receiver. As one post said on the Tampa Tribune website, he was the only one with the “stones” to go over the middle AND actually catch the ball. Yet he too faced a similar phasing out as Galloway. And let’s not forget how June had to learn the SLB position. While he didn’t emerge as the anticipated defensive force we had hoped, he was still a solid at the position. He’ll be a big signing this off season for another team looking to fill a WLB vacancy. And then, Brooks and Dunn. Future Hall of Famers. Class acts all around. Now out of a job. They will be remembered for their abilities on the field. But for many families and children in the bay area, these two men directly affected their lives by education. Dunn is known for his Homes for the Holidays campaign, giving a family in need a much deserved home. Brooks’ Bunch, Derrick’s foundation, goes on special trips each summer, one of which included a trip to Africa. Not to mention that these individuals are men of outstanding character and a genuinely positive influence in the sports world. Everyone will be missed, and while I do not agree with the way DB55 was treated, this is the direction the Bucs need to take. Teams are consistently getting faster and offenses more creative and able to counter the signature Tampa 2. While defense has been what the team has always hung its hat on, it’s become nothing but a fragile reputation. Heck, I feel that at times we’ve overachieved in recent seasons on defense, given the age and (in)experience. Losing a leader like this is never easy. It will be time for players like Barrett Ruud and other incumbents to take over and grow together, much like how (oh so long ago) the young, newly drafted Brooks, Sapp and the rest of our young defense developed into one of the greatest of all time. It can happen again. The only difference this time is that we’ve been spoiled by the taste of success, and now it is expected. I guess 20 or so losing season can make anyone desperate to never want to be that bad again. Let’s wait for how Dominik, Morris, and the Glazers approach the offseason and the draft before we write off the season, staff, and administration. We can denounce the treatment of one of our most iconic players. 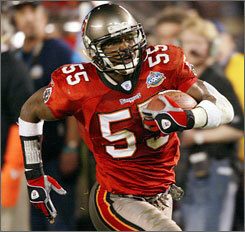 It was a classless, irreverant move, and Derrick Brooks (and even Warrick Dunn) deserves much better. So to Derrick Brooks and Warrick Dunn: Thanks for making the lives of others that much brighter, whether it was through on-field excellence or a passionate dedication to the community. You both will be missed. And of course we can’t have a Derrick Brooks post without showing of the greatest United Way commercial of all time. Que Le Pasa a Este Tipo? CINCINNATI (AP)—Maybe receiver Chad Johnson can go by the name that his head coach hates. The Cincinnati Bengals receiver has legally changed his name to Chad Javon Ocho Cinco in Broward County, Fla., a switch that became official this week, according to several media reports. Johnson, who lives in Miami, didn’t return a message left on his cell phone Friday night. Bengals spokesman Jack Brennan said the Bengals had no comment on the matter. Johnson has been a concern for the Bengals this season. He unsuccessfully lobbied for a trade in the offseason, threatening to sit out if he didn’t get his way. When the Bengals refused, he relented and showed up for minicamp, but complained that his right ankle was bothering him. He had bone spurs removed from the ankle and was limited at the start of training camp. In the second preseason game, he landed awkwardly and temporarily dislocated his left shoulder. Johnson is wearing a harness and expects to play in the season opener against Baltimore. So line up and get ready to buy a Chad Ocho Cinco jersey at your nearest sports retailer. I was reading some message boards and people were joking around hoping that Ocho Cinco would get traded to a team where he could not use the number 85! How hilarious would that be? Going through the legal troubles to change your name and you can’t even wear 85? My favorite line from the article is when he says that “It’s something I don’t think anyone has done before.” Well no kidding. You are unique, Mr. Ocho Cinco, a very unique and needed figure in the NFL. Kudos. *Update: Sorry for no posts the last almost 2 days! I just needed to take a breather and enjoy this weekend! SCi Fi list 20-16 up today FOR SURE. Rays page to be updated appropriately, and music reviews upcoming this week! Thanks for reading heapsters!